Faculty in the anthropology department have focused on creating a safe, inclusive culture after allegations of sexual assault emerged about the department's former chair. 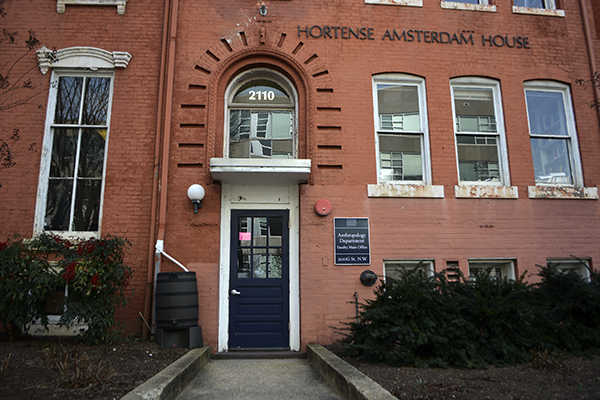 Updated: Feb. 16, 2016 at 9:01 a.m.
Members of GW’s anthropology department are taking a closer look at interactions among faculty and students after a former department chair allegedly sexually assaulted a fellow researcher. Brian Richmond, who worked at GW until 2014, is alleged to have sexually assaulted a research assistant from the American Museum of Natural History in September 2014. The research assistant said that Richmond had sexually assaulted her at an anthropology conference in Florence, Italy, Science Magazine reported last week. Richmond did not return multiple requests for comment for this story, but Science Magazine reported that Richmond denied allegations of assault. He left the University in 2014 to serve as the American Museum of Natural History’s curator of human origins, where he still works today. Faculty said the allegations are reflective of a potentially broader culture across anthropology – while research assistants work abroad, they often work in close proximity with leading faculty, which can lead to unintended or intended instances of sexism or inappropriate behavior. A national survey conducted in July 2014 found that 64 percent of female research respondents in science fieldwork had experienced physical or verbal sexual harassment. Faculty in the anthropology department said that during the four years Richmond led the department, he frequently formed relationships with students that seemed too personal, acted unprofessionally during field research and made them feel uncomfortable expressing their concerns about the work environment. Richmond remained employed at a field school affiliated with GW but he was fired from the post in April in light of the allegations. Following the allegations, anthropology faculty say they have heightened their focus on creating a more inclusive and safe culture in their department. This year, they have created a committee on diversity in anthropology research, surveyed women in the department about how supported they feel by male faculty and plan to continue conversations on the topic in the coming months. Bernard Wood, a professor of human origins, said some anthropology faculty learned of the allegations during a conference last March. Wood, who was a mentor to Richmond for years, said once he discussed the rumors with faculty in the department, a “disappointingly large number” of people said the allegations did not come as a surprise. He said while no allegations of assault have emerged from Richmond’s time at GW, faculty had expressed concerns about Richmond’s sometimes overly personal relationships with students. “They all pointed out that the allegation of assault was not what they were talking about, but I think they described it as consistent over-familiarity with students,” Wood said. The researcher Richmond allegedly assaulted was not named in the Science Magazine story and was not a student at GW. After collecting information from GW employees, members of the anthropology department contacted the Title IX office, but since Richmond had left the University, there was not much the office could do, Wood said. A University spokesman declined to comment on the specific case within the anthropology department but shared a statement stating that the University “investigates allegations of sexual misconduct brought to its attention,” and provides trainings for all faculty, staff and students. Six current faculty members declined to comment and 25 current and former faculty members did not return request for comment. Faculty said they noticed Richmond’s unprofessional behavior during research trips to the Koobi Fora Field School, which partners with GW and the National Museums of Kenya. Some researchers travel to Kenya for six-week sessions, and Richmond served as a liaison to the program until April 2015 before being removed from the post. Wood said researchers told him that Richmond poorly managed the research site, allowing the experiment locations to become parties every night. Wood said that field work requires a leader who is conscientious and professional because the sites are often cramped and can seem more informal than a classroom setting. Over the past year, graduate students and researchers have worked on making the Koobi Fora Field School more inclusive and safe for women. David Patterson, a graduate student of paleobiology who has studied at the field school in Kenya, said the field school is on the forefront of addressing harassment in the field. The school’s webpage about health and safety highlights a “zero tolerance” stance on sexual harassment. At GW, anthropology faculty have also committed themselves to improving the culture within the department. Wood said he has led an effort in the department to train men to treat female researchers respectfully. Last winter the Center for Advanced Study of Human Paleobiology – housed in the department – created a “women in science” group which has since become a “diversity in science” group, Patterson said. The group has discussed ways to make anthropology research more diverse. Professors said the anthropology department had already been working on ways to make its faculty and staff more diverse, which they increased after hearing about the allegations against Richmond. Richard Grinker, the chair of the anthropology department, said the department has spent the last several years making sure employees understand off-campus behavior policies and sent a letter to students and faculty about procedures in the case of sexual misconduct. He said the reporting mechanisms can be “unclear or unknown” when sexual misconduct occurs off campus at field schools. “We have worked hard – especially CASHP – to develop a system to ensure that students, faculty and staff are as informed as possible,” Grinker said. Shannon McFarlin, an assistant professor of anthropology, said officials in the Title IX office hosted a workshop last spring to review scenarios of sexual harassment, explain how to report it and discuss guidelines for respectful behavior. She added that a “men as allies” group has been added to the existing diversity group so male faculty can understand more of the challenges their female counterparts might face. “We have all worked very hard as a program to signal a zero tolerance policy for sexual harassment, assault and other forms of misconduct or sexism that jeopardize a safe, supportive and inclusive working environment,” McFarlin said in an email.